This gate was opened in 1740 as part of the works involved in the third expansion of the town, and it is the third gate to bear this name. The first gate by this name is the gate that now provides access to the castle courtyard. Prior to the castle’s completion in the early 16th century, it provided direct access to outside the town. A second gate called Saint-Thomas was opened in-between the tower called the Tour Quic-en-Groigne and the current Hôtel de France et de Chateaubriand, which was built on the site of the old Saint-Thomas chapel in the last quarter of the 19th century. In the 13th century, this chapel was annexed to the first town hospital founded on this site. It was adjacent to this gate that the bathing bureau was also established. 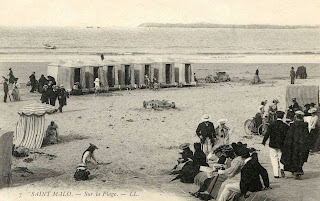 In 1835, the town of Saint-Malo decided to develop sea bathing, which turned out to be increasingly successful. 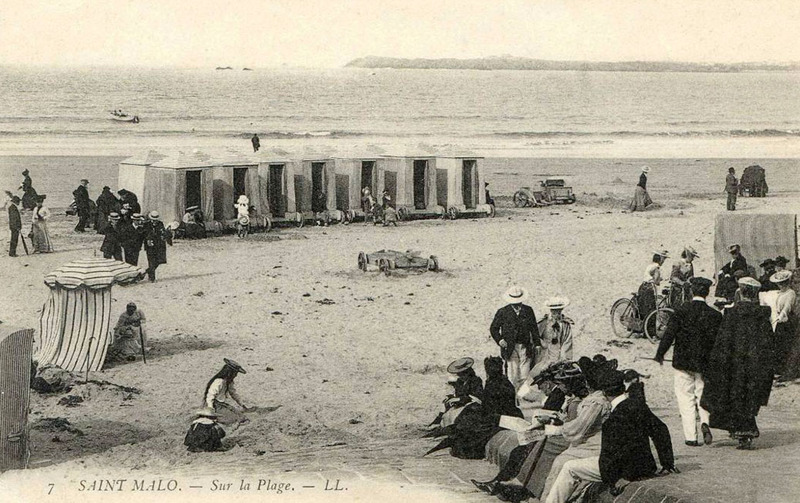 The first mobile changing sheds were made available to bathers and a bathing establishment opened in 1838 on the northern side of the castle. Horse-drawn wheeled changing sheds were then put in place. From 1843 onwards, separate bathing areas were established for women and men. In 1905, it was still obligatory to wear pants that extended below the knees, a shirt or a vest.